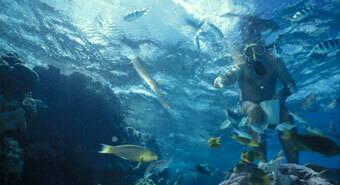 The Great Barrier Reef in Australia is an immense and very unique coral reef. 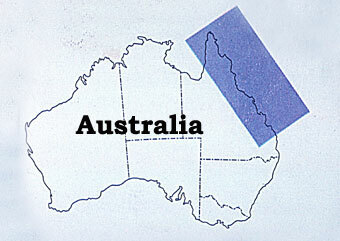 The continent of Australia, in the southern hemisphere, is about as big as the entire United States. 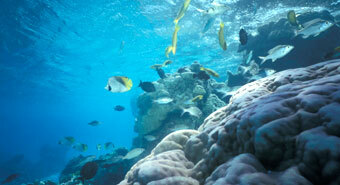 One of Earth's wonders - the Great Barrier Reef - is located off the northeastern side of Australia. 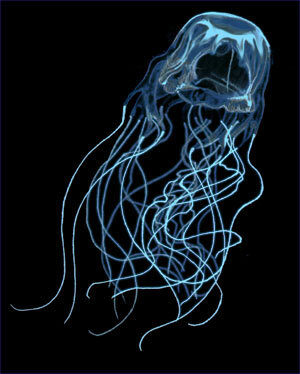 It is the largest biological structure on Earth and one of the only naturally occurring structures that can be seen by satellite. The Great Barrier Reef is not one reef but a chain of over 2,000 reefs located anywhere from 10 to 150 miles off the northeastern coast of the territory of Queensland in Australia - extending some 1,250 miles from north to south. It is actually not a true barrier reef as defined by the 'classic' coral reef formation and originally described by Charles Darwin in the 1800's. 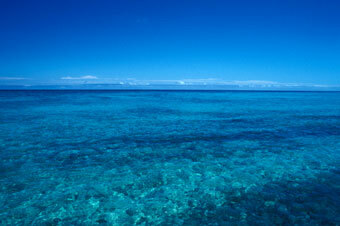 Most of the Great Barrier Reef is almost entirely underwater. 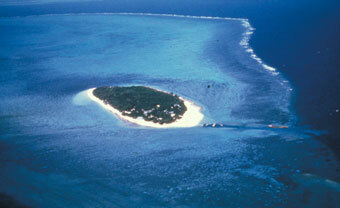 Wistari Reef (left) is in the foreground and Heron Reef is in the background separated by a deep channel. 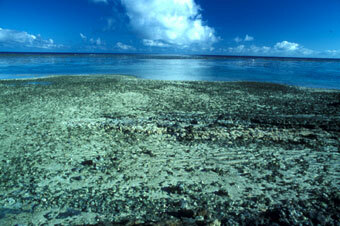 Part of Heron Reef filled in with debris (mostly broken coral) and a cay, knows as Heron Island, formed. 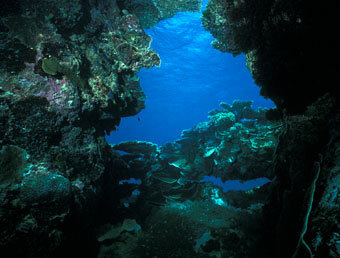 These reefs are typical of the Great Barrier Reef. 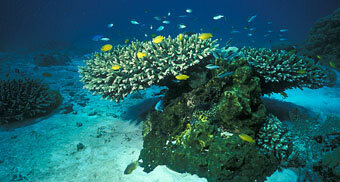 Each of the 2,000 reefs making up the Great Barrier Reef has its own particular shape and name. 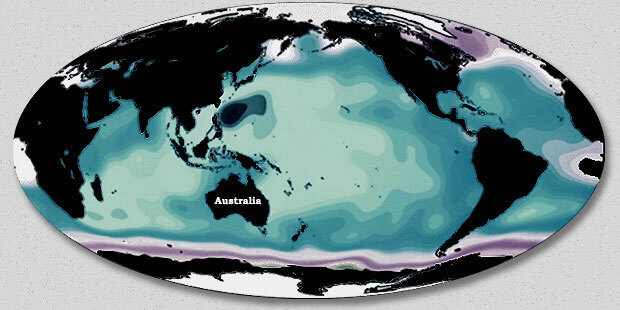 Australia is not a true barrier reef because it is a continental island (not volcanic) and is not sinking. 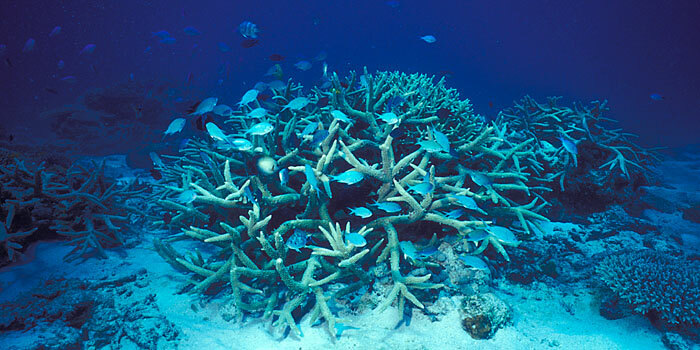 It is unique among coral reefs. Its history began some 15,000 years ago when Earth was experiencing an ice age and much of North America was covered with glaciers. These glaciers held a lot of Earth's water so that the oceans were some 300-400 feet lower than they are today. 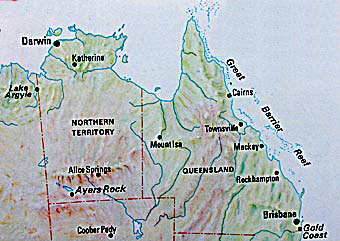 The area that is now the Great Barrier Reef was a broad, flat, coastal plain then - land, not sea. 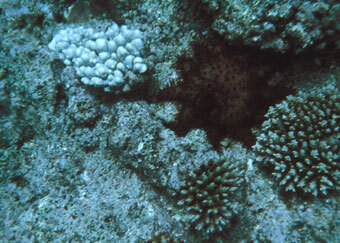 Coral larvae, in the ocean, had settled along the edge of this plain and grown into coral heads as a reef (similar to the formation of a 'classical' fringing reef). Gradually, the glaciers melted and sea level rose to its present height where it stabilized about 6,500 years ago. 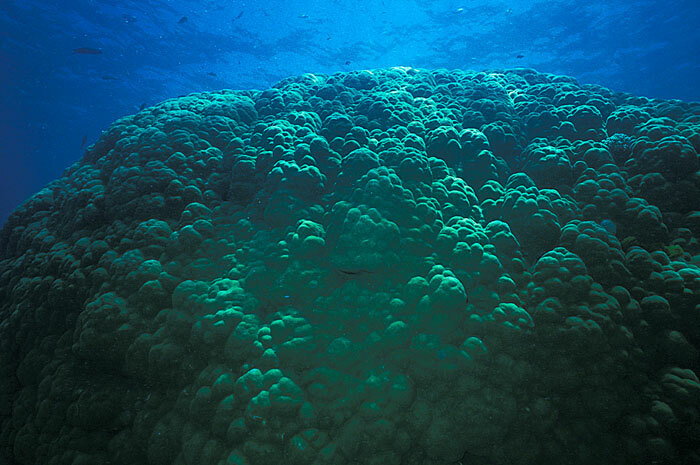 As the sea covered the coastal plain on Australia's northeast coast, many of the coral heads grew upward. 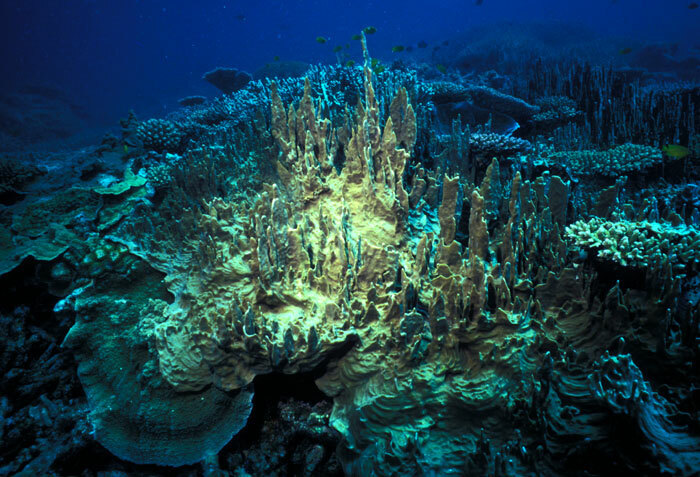 About 2,000 of these grew fast enough to keep the upper (living) part of the reef in the lighted surface waters so the symbiotic zooxanthellae, in the coral animal's tissues, could live. 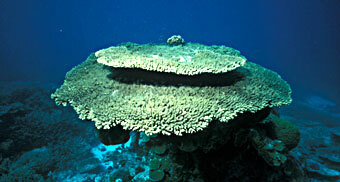 As sea level stabilized these isolated individual reefs began to grow out. Their tops were "mowed down" by waves, tides and storms so they remained just under the surface of the water but expanded in width (just as you saw Wistari Reef in the foreground of the last image). 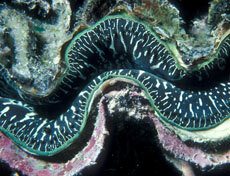 Each reef is unique - many are table reefs (like Wistari) but some are long, thin, ribbon reefs. 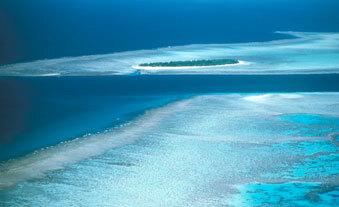 Unaware of the spectacular reef below, visitors approaching the cay, called Heron Island, are in for a treat. 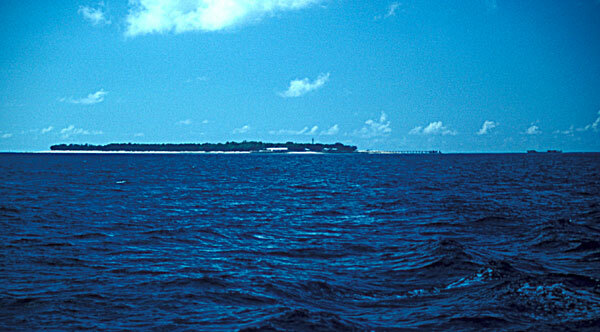 Heron Island has been quite stable for a long time and has a lot of plant growth on it contributing to its stabilization. There is a marine lab and a resort on this tiny island. 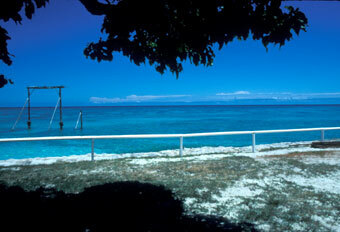 People used to row across the reef before the harbor was built on Heron Island. 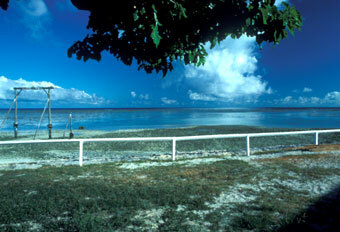 This view from Heron Island at high tide shows the structure used to hoist baggage and supplies out of the boats at high tide while people waded ashore. At low tide the baggage and supplies could be retrieved without any chance of it getting soaked. The reef is exposed at low tide, often leaving over 100 yards of low tide reef area to walk across before getting to the edge of the reef. 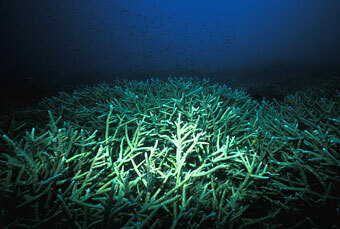 The edge of the reef has the most life as the reef continues to grow and expand. Jumping off the edge of the reef one is immediately amazed at the diversity of coral. 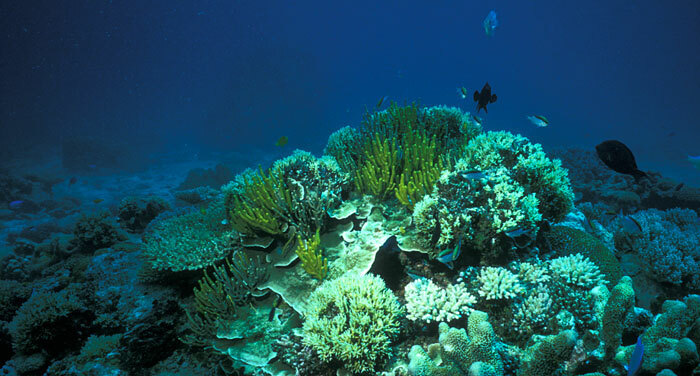 Each reef has its own diversity and patchiness. Although the coral makes the reef, there are many species, like these fish, who make their home in and amongst the coral. 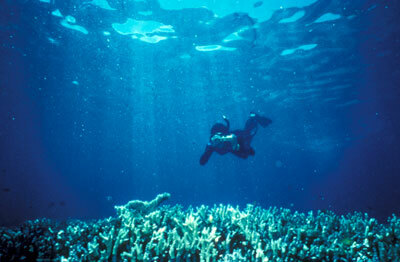 Some areas of the reef are dominated by a few species. Here, at high tide, a snorkler dives down to the flat top of this part of the reef made up almost entirely of staghorn coral. A close-up of staghorn coral shows its colonial nature - each flower-like cluster is a single coral animal called a polyp, living condo-style, one next to the other protected by their fused corallites. 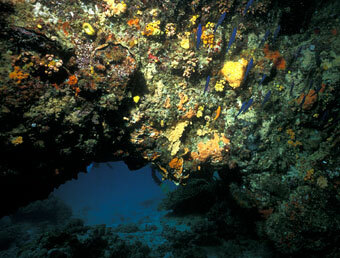 Some areas of the reef are diverse. 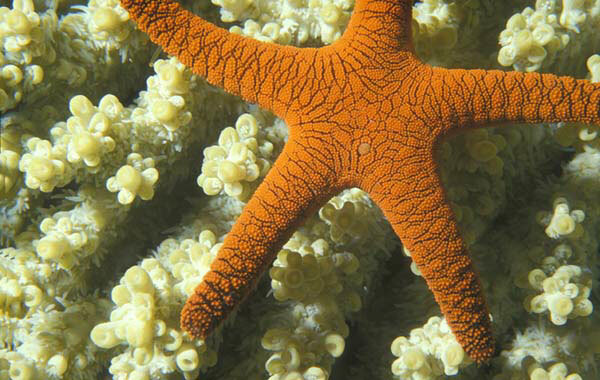 Coral comes in many shapes, sizes and colors. 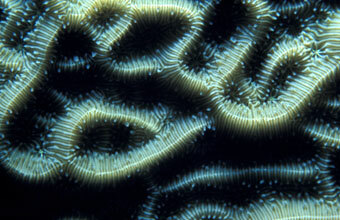 Brain coral polyps are hard to distinguish. 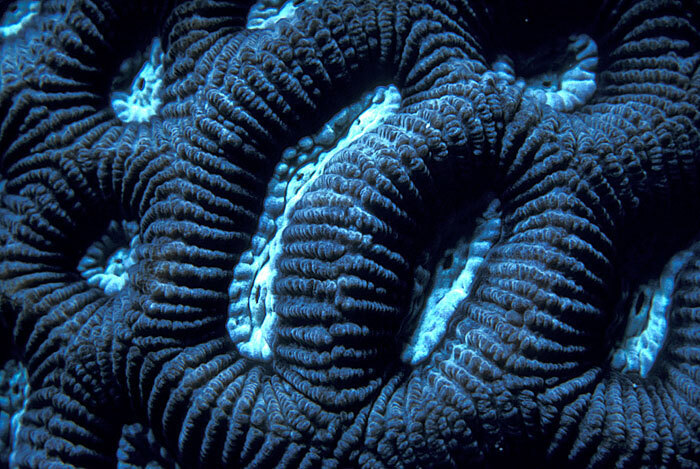 The polyps of brain coral form rows (from asexual reproduction called cloning) where they do not separate their corallites next to each other (an unusual growth pattern). These rows look like the ridges in a vertebrate brain. 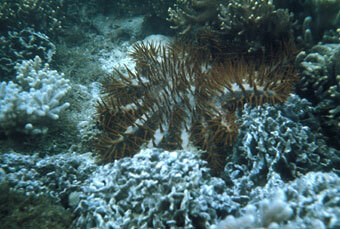 If you look closely in the above image you can see where the individual polyps would be found. 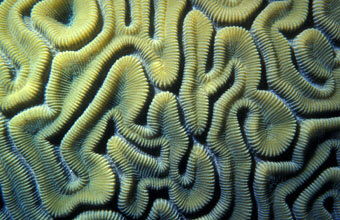 A close-up of brain coral reminds you of the colonial nature of most reef building corals and shows one polyp dividing in the center. All this change and growth is due to as many as 70 or more species of reef building coral (hermatypic) building the reef up and out as they grow. 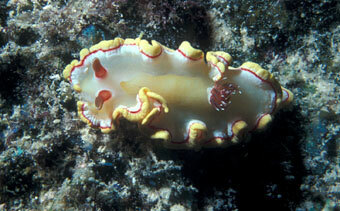 Each polyp secretes its skeleton (the corallite) with thin walls (called radiating septa) pointing toward the mouth. 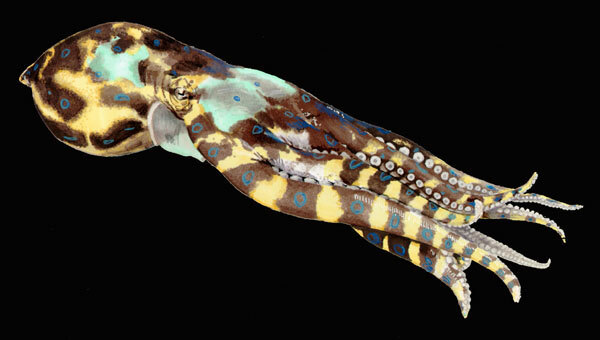 Each species competes for food and space, often becoming (or creating) a home or hiding place for other species. 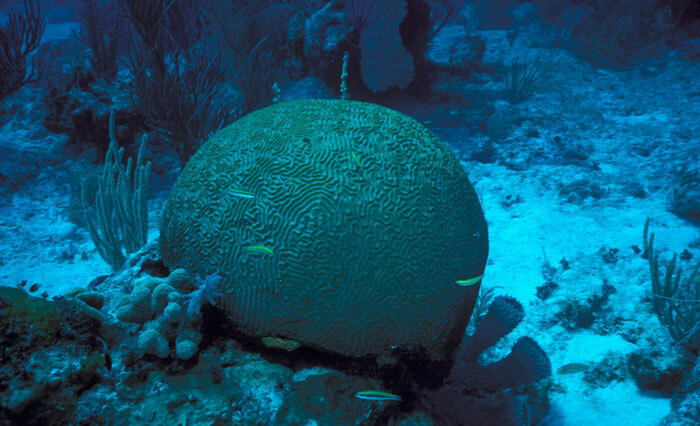 Physical breakdown offsets this biological buildup as tides, waves and storms "mow down" the upward growth, depositing rubble to fill in channels or form cays on the reef. 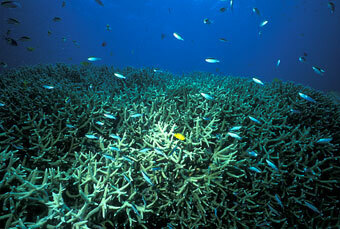 Biological breakdown occurs on reefs as organisms eat each other. 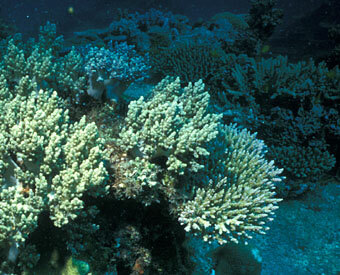 Over time each reef changes both in shape and species as all these forces interact. 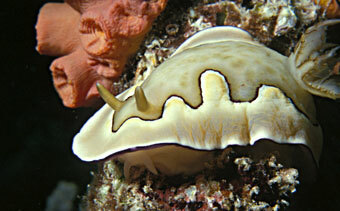 There are many other species of animals besides the reef building corals that are important on the reef. 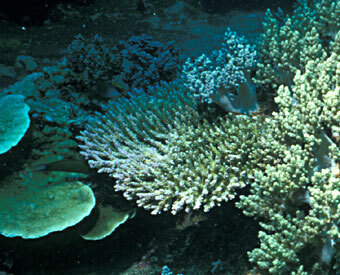 Several soft corals (some called sea fans or gorgonians) contribute greatly. The soft corals do not form the stony corallite skeletons but they do secrete some calcium - that may end up cemented as part of the reef. 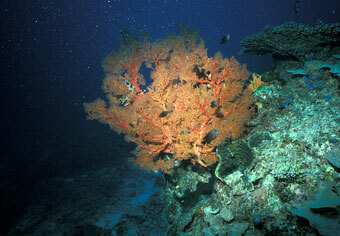 Gorgonians (sea fans) are similar to true coral. The many identical, very tiny, polyps of sea fans all came from one parent - together they secrete a firm, but flexible skeleton (with calcium) to hide in. 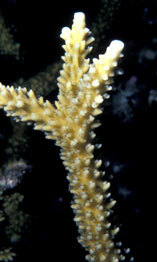 Pieces of these sea fan skeletons can help to form the reef. 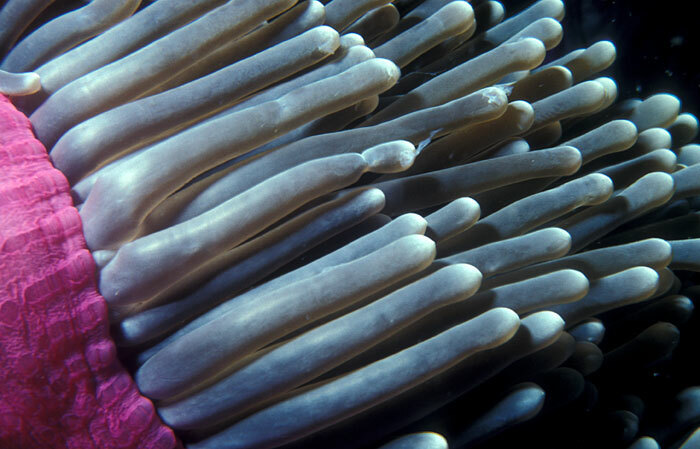 Soft coral polyps always have eight (pennately branched like an antennae) tentacles on each polyp and are almost always colonial (cloning). 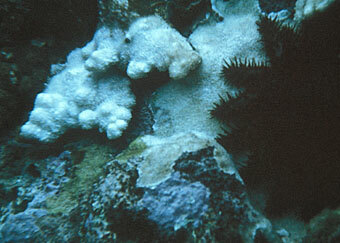 Other soft corals have no skeletal hiding place, such as this cauliflower coral. 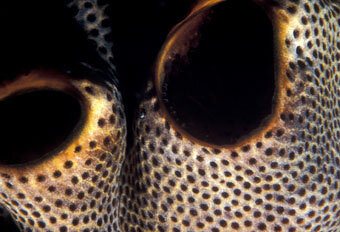 Their tissues have chemicals called terpenes that are toxic to most fish and other would-be predators. 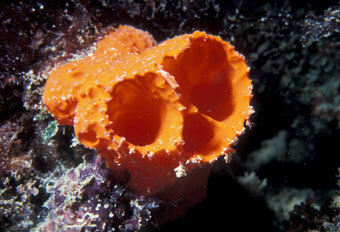 When in contact with soft corals the hard corals lay down calcium carbonate and put up a wall to imprison it. 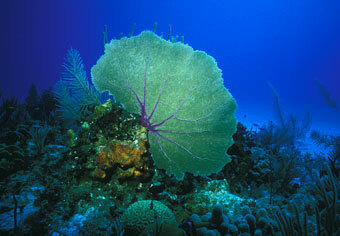 These soft corals can move and may leave a trail on the hard coral. Besides corals, the Great Barrier Reef is alive with an incredible diversity of creatures including invertebrates (like sponges, worms, slugs, clams, seastars and anemones), and vertebrates (like fish, sharks and birds). 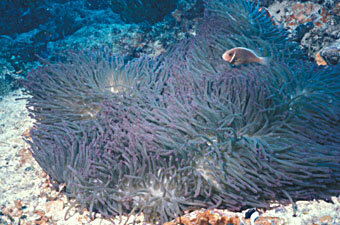 Clownfishes (anemonefishes) and sea anemones have a unique and interesting symbiotic relationship in the tropical Pacific Ocean. 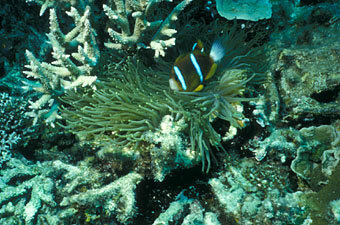 This results in the clownfish's ability to hide in the anemone's tentacles for protection. 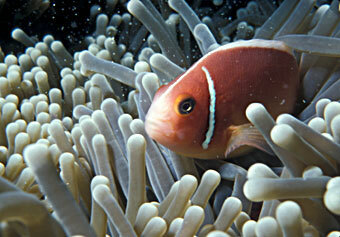 In return for the protection given by the anemone, the clownfish often catches food and brings it to the anemone. Sometimes a clownfish will grab another fish by the fin and pull it into the stinging anemone tentacles where it is killed. 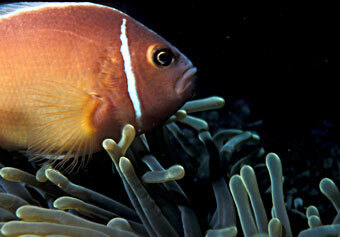 But the resident clownfish is not hurt. 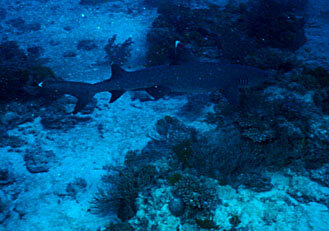 Sharks are one of the major predators on the Great Barrier Reef. 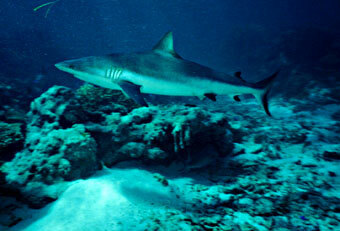 These whitetip and gray reef sharks are usually on the prowl looking for food. They may congregate, at low tide, in small indentations in the reef edge that collect the warm water running off the reef flat. 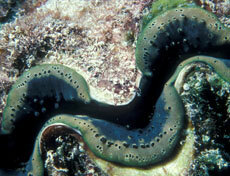 There is often a lot of food in this reef runoff. These sharks remind us that all is not safe on the Great Barrier Reef. Although this crown of thorns sea star is not deadly - its spines can inflict a painful wound on humans that usually kills the skin area. 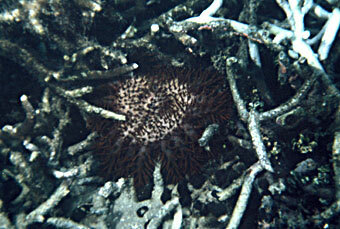 The crown of thorns is a coral eater. 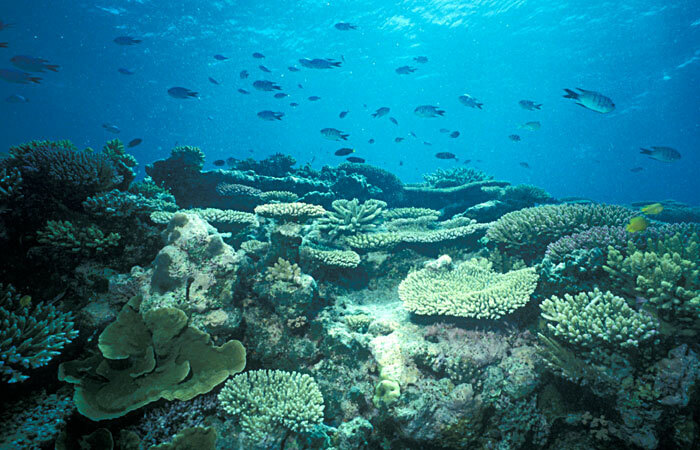 In recent years there has been an increase in its population on many Pacific coral reefs, including the Great Barrier Reef. 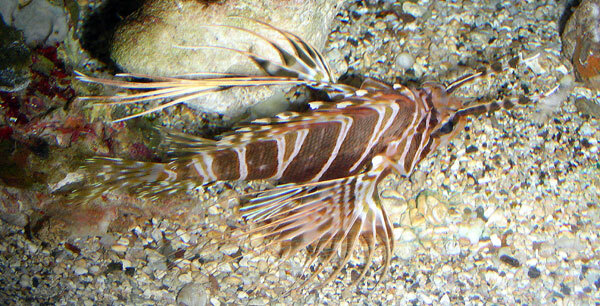 Some of these reefs have been heavily damaged and may be endangered from this predator. 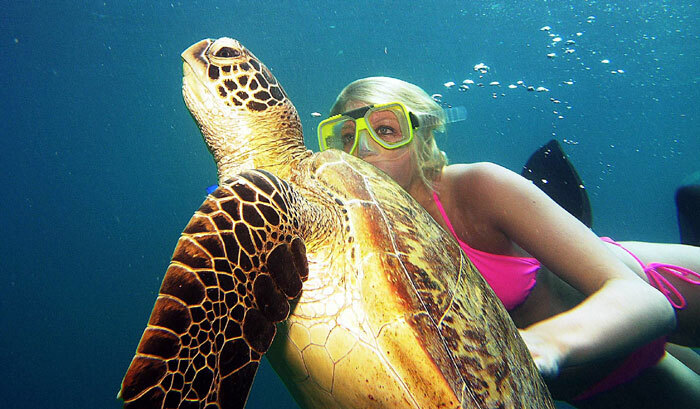 Marine turtles are common in Australian waters and provide a wonderful experience for divers. 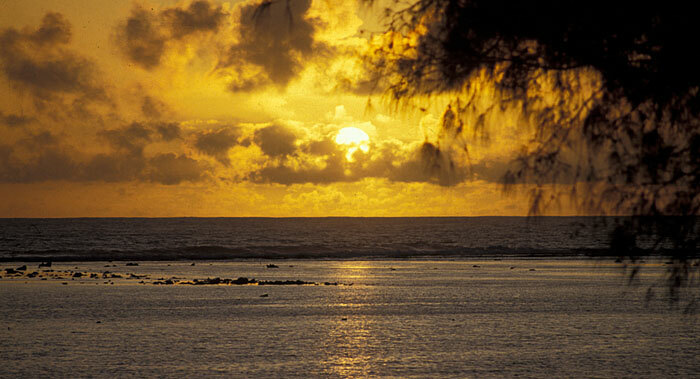 The tend to 'hang out' near particular beaches where they nest onshore but it is only the females who come ashore. 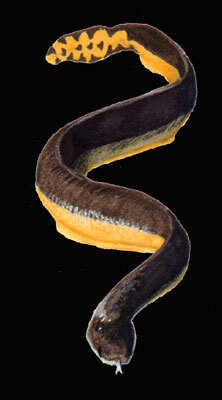 The males stay in the water and mating is in the water. 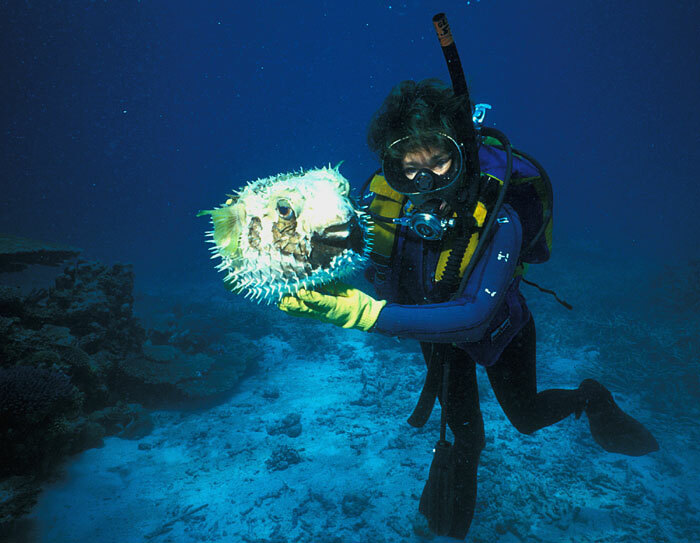 Thanks to the summer 2006 Marine Science student who donated her photo for inclusion in this lesson. Marine turtles may use Australian beaches, during the Australian summer from November to February, for reproduction sites. Six species of marine turtles are found in Australia but only 3 use the Great Barrier Reef for nesting - the green, loggerhead and hawksbill. 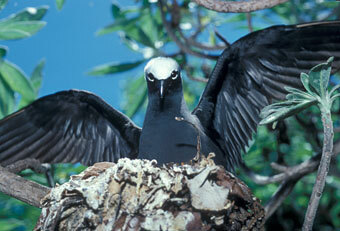 Many seabirds may nest on the islands of the Great Barrier Reef. 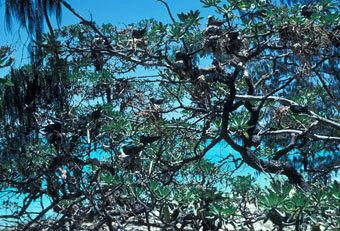 On Heron Island 120,000 black noddys arrive during Christmas time. 50,000 mate, build nests in the trees and raise their young each year. The noddys stay on their nest until the baby hatches. They feed the baby regurgitated fish caught in the surrounding waters. In March or April they all leave to fly north. Many other birds are found along the Great Barrier Reef. 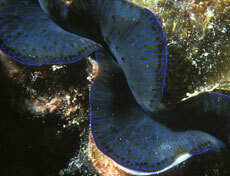 Most are fish eaters, like this underground nesting mutton bird, and most use the prolific reef for their dinner table. As we say good-bye to the Great Barrier Reef we are reminded of its origin as sea level rose over a continent, in the warm water tropics; its true coral that forms the reef itself; the many species of marine life living in and on the reef including poisonous forms; and creatures like the turtles and birds that rely on the reef for food and use the island for reproduction.